AccuraCast SearchStarz Blog: Is Google Testing Twitter App for Glass? Just recently we told you about the New York Times app that has been developed for Google Glass, but it would appear that a much more popular app is in the offing. 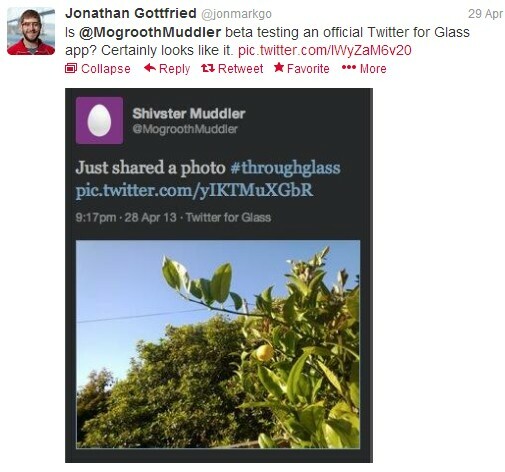 The below tweet appeared yesterday, with the hashtag and the fact that it was uploaded through 'Twitter for Glass' leading many to believe that Google is currently testing the app. The fact that the profile @mogroothmuddler no longer exists makes this extremely likely. How much would you like to simply tweet what you see?